People of metropolitan cities in Japan, England, America, India, China etc. traveled in metro train (Underground Railway) and many countries trying to started underground railway system. But do you know about first underground railway? world's First metro train (underground railway) work started in 1860 in London, England. When the Metropolitan Railway began building a tunnel (Tube) more than three miles long from Paddington to Farringdon Street. It was largely financed by the City of London, which was suffering badly from horse-drawn traffic congestion that was having a damaging effect on business. The idea of an underground system had originated with the City solicitor, Charles Pearson, who had pressed for it for years. It was he who persuaded the City Corporation to put up money and he was probably the most important single figure in the underground’s creation. He died in 1862, only a few months before his brainchild came to life. A deep trench was excavated by the ‘cut and cover’ method along what are now the Marylebone Road and the Euston Road and turning south-east beside Farringdon Road. Brick walls were built along the sides, the railway tracks were laid at the bottom and then the trench was roofed over with brick arches and the roads were put back on top, though the last stretch to Farringdon was left in an open, brick-lined cutting. Stations lit by gas were created at Paddington, Edgware Road, Baker Street, Great Portland Street, Euston Road and King’s Cross on the way to Farringdon, which was at ground level and was built, not entirely inappropriately as things turned out, on the former site of the City cattle market. W.E. Gladstone, who was Chancellor of the Exchequer at the time, and his wife Catherine were passengers on a trial trip in May 1862. Built round the clock by shifts of navvies, the line had to avoid numerous water and gas pipes, drains and sewers. 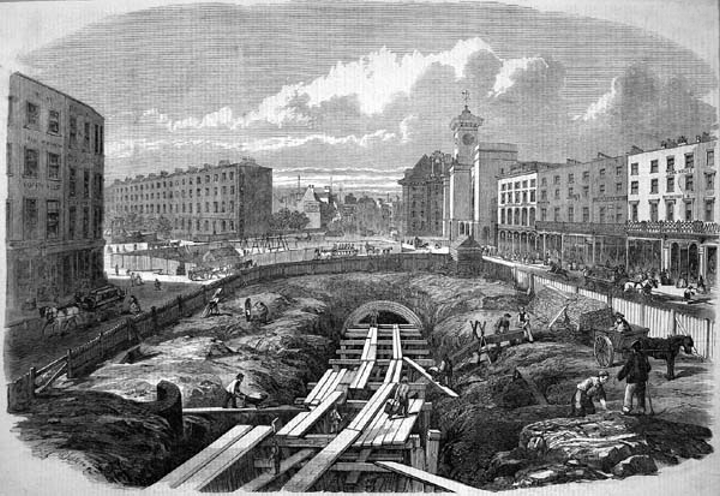 There was a problem when the noxious Fleet Ditch sewer flooded the works in Farringdon Road, but that was dealt with and on January 9th, 1863 the line’s completion was celebrated at a gathering of railway executives, Members of Parliament and City grandees including the lord mayor. The prime minister, Lord Palmerston, had declined his invitation, saying that at 79 he wanted to stay above ground as long as he could. Starting from Paddington, some 600 guests were carried in two trains along the line to Farringdon Street station, where a banquet was held, speeches made and due tribute paid to the memory of Charles Pearson. Music was provided by the Metropolitan Police band. Over the next two years the line was extended further east into the City to Moorgate and, in the other direction, to Hammersmith. Other lines were soon added to the growing network, deeper underground tunneling was introduced and the steam trains were replaced by electric trains. The first underground electric railway, the City and South London, which ran from near the Bank of England under the Thames to the South Bank, opened in 1890. It was the first line to be called ‘the tube’ and the windowless carriages with their heavily upholstered interiors were popularly known as ‘padded cells’. 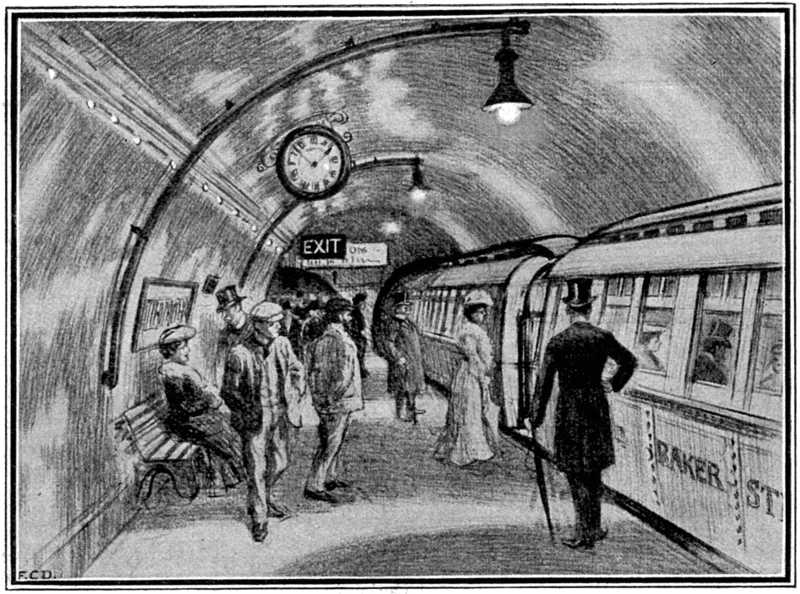 As far as the City was concerned, the corporation was able to sell its shares in the Metropolitan Railway at a profit and the underground did ease congestion for a time. A more lasting consequence was to make commuting far easier and so cause London to sprawl out even more from its center, while the number of people actually living in the City itself declined sharply.